Both inherently fire resistant fibres and flame retardant wool fibres are widely used in clothing to protect industrial workers operating in the environments where there is a risk of fire. Most of those technical textiles are required to have not only fire retardant properties, but also moisture management properties with consideration of the users’ thermophysiological comfort in specific environmental situations. 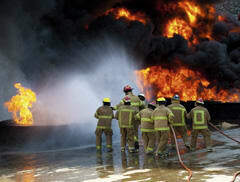 For industrial fire protective clothing, reduction of the heat stress experienced by an employee wearing PPE is mandatory through the introduction of the requirement for Total Heat Loss. In addition, workers wearing full PPE in hot environments are often wet with sweat, in protective clothing heated from thermal radiation and hot gas convection. Clothing that contains fibre components with moisture management properties can thus be an advantage to achieve both thermal protection and comfort requirements. When working in hot environments workers are exposed to the risk of thermal stress. It is believed that the protective clothing itself can sometimes also add to the associated cardiovascular and thermal strain. It was observed in firefighters that wearing PPE during recovery showed a continuous increase in rectal temperature and a decrease in heart rate, which increases the threat of heat stress. It has been found that the sudden cardiac death triggered by thermal and thermophysiological stress of protective clothing might play a more significant role in the responsibility of fatality of workers than the products of combustion - heat and smoke. Heavy sweating and massive metabolic heat are generated from the human body when working in hot environments while wearing cumbersome protective clothing. In addition to heat radiated by the hot environment and physical activity, this strain on the body is also attributed to the heavy weight and restrictive nature of certain protective gear, which can add to the metabolic generation and interfere with heat dissipation because of the encapsulation. As an example, it was reported that the skin and internal temperature of firefighters wearing protective gear increases and the rate of heat transfer of the clothing decrease due to their limited permeability to water vapour. Meanwhile, the moisture and sweat produced significantly increased. It was reported that just modest sweat loss during less than 30 minutes of firefighting activities can be extrapolated in the range of 1.1-2.2 pounds per hour, while the body weight loss due to sweating during exercise in a hot environment while wearing firefighters’ clothing could be as high as of 2.8 pounds per hour. Furthermore, the increase in the rate of sweating causes reduction of the heat dissipation from the body. With this in mind, moisture management properties of the fibres used in protective clothing are highly desirable. Both inherently fire resistant fibres and flame retardant fibres are used in firefighters’ protective clothing. Inherently fire and heat resistant fibres are made from either all-aromatic/hetero-aromatic polymers, polymers containing certain elements such as halogen, or inorganic/mineral materials. Their molecular structures are very difficult to be decomposed in high temperature, offer heat resistance and reaction to fire. Such aromatic polymers including Nomex ® , Kevlar ® , Technora ® , Zyex ® , Ryton ® , Kermel ® , Zylon ® , PBI, and P84 are non-thermoplastic and combustion-resistant, with decomposition temperatures above 375°C and with LOI (Limiting Oxygen Index) values of 30% or more. They usually have excellent char-forming tendencies. In comparison with other natural and manmade fibres, wool is an inherently low flammability natural fibre that self-extinguishes when exposed to a flame, due to relatively high nitrogen (16%) and sulphur (3-4%) contents, high ignition temperature (570-600ºC), low heat of combustion (27kJ/g) and relatively high LOI (25-27%). It burns slowly without melting and dripping, and it self-extinguishes when the heat source is removed. Wool is widely used in technical textiles, which are subject to increasingly mandatory flammability regulations including for protective clothing. The typical flame-resistant applications of wool include interior parts of buses or cars such as seat fabrics, pillow covers, blankets, sidewall panels, cushions and carpets. Although wool fibres have a certain level of flame retardant properties, it is still flammable. Flame in wool can propagate once ignition has occurred, which restricts their specific applications in protective clothing for handling molten metals, apparel used in aircraft interiors, for military clothing and worn by race car drivers. Wool fibres having both unique moisture properties and excellent flame retardant properties are therefore desirable for high flame-and-heat resistant textiles. Conventional chemical treatments to confer non-durable flame retardant finishes to wool include treatments with the flame retarding agents applied to cotton, such as salts of bromide (e.g. ammonium bromide), borate (e.g. boric acid-borax), phosphate (e.g. ammonium phosphates and polyphosphate), metals, and tetrakishydroxymethyl phosphonium, and titanium compounds. Relatively more durable ﬁnish of wool fabrics could be obtained via the treatment using sulphation with ammonium sulphamate followed by curing at 180-200°C in the presence of urea. Many traditional flame retardants for wool fibres were based on halogen compounds (e.g. chlorendic, tetrabromophthalic anhydride and dibromo-maleic anhydrides and brominated salicylic acid derivatives), which either react with wool fibres or form cross-linked structures on the fibre surfaces. These halogen compounds influence the pyrolysis reaction, prevent the formation of flammable volatiles, and promote the formation of char and thus act as flame retardant for wool. In comparison with the limited flame retardant effects of those chlorinated flame retardant agents, however, many chlorinated flame retardants are carcinogenic and have been legally banned. In addition, quite a few of the chlorinated flame retardants have been restricted, as they could produce highly toxic and corrosive gases with great amounts of smoke in combustion. Some bromine-containing flame retardants have the potential to form dioxins and furans under either severe thermal stress or in combustion. Flame retardant processes based on functional phosphorus chemicals have been widely studied. It is known that ammonium phosphates and organophosphorus species with Lewis acidic properties are effective flame-retardants for wool and each enhance char formation. A flame retardant dimethyl-2-(methacryloyloxyethyl) phosphate (DMMEP) was applied to wool fabrics by the graft copolymerisation technique initiated with potassium persulfate (KPS) in water media. With a DMMEP add-on increase from 50% to 100% on the weight of wool fabric, the treated wool fabric demonstrated high flame retardancy with an LOI above 35%. However, such treatment yielded a relatively large decrease in fabric permeability and tensile strength. Commercial flame retardant processes based on the phosphorus finishes such as Proban ® and Pyrovatex ® for cellulosic fibres have also been applied to wool. Proban ® process applied a condensation of tetrakis (hydroxymethyl) phosphonium chloride (THPC), urea and melamine resin on wool fabric, followed by curing and oxidation. While Pyrovatex ® process employed methylol dimethoxyphosphonopropionamide (Pyrovatex CP) to react with wool with the use of melamine resin, the formation of a high thermal resistance insulation char layer during combustion of the phosphorus intumescent agents treated wool fabrics was demonstrated. These treatment processes, however, involve the use of carcinogenic compound formaldehyde, which is released from these chemical treated wool fabrics. Other flame retardant agents including inorganic compounds (e.g. ammonium polyphosphate, melamine phosphates), cyclic polyol phosphoryl chloride, sol of metal oxide (e.g. SiO2, SiO2-Al2O3), and alendronate or pamidronate were also reported for the treatment of wool fibres. In those treatment processes, however, a great amount of cyclic polyol phosphoryl chloride discharged to effluent causes environmental issues, the sol of metal oxide treatment was not durable and alendronate and pamidronate treatment showed only a slight increase (1-2%) of LOI in treated wool fibres. Therefore, alternative technical routes to improve the flame retardant properties of wool materials are desirable. Currently, Zirpro ® wool treatment process based on the exhaustion of anionic complexes such as hexafluorozirconates (ZrF6 2- ) and hexafluorotitanates (TiF6 2- ) onto positively charged sites in wool under acidic conditions is one of the successful flame retardants for wool and is still in use today. Although the precise mechanism of the formation of zirconium or titanium dioxide in the wool fibre as the effective flame retardant is still not clear, it is found that the F/Zr ratio is constant over a wide range of temperature from ambient temperature to 350°C, indicating that ZrOF2 is one of the most probable reactive intermediates during flame retardation. Benisek attributes it to enhanced intumescent char formation in the condensed phase, but Beck et al contest this view. Its ability to create extremely effective ﬂame and heat barrier properties at high heat ﬂuxes, however, is clearly associated with the char structure generated. The LOI of the Zirpro ® wool was in a range of 30-35%. Major advantages of this treatment are the absence of any discolouration or other effect on wool aesthetics, coupled with its application via a simple exhaust process at a relatively low temperature of 60°C. The treatment can be applied to wool at any processing stage from loose fibre to fabric using exhaustion techniques. Zirpro process could also be used in the flame treatment of wool blends. While antagonisms between Zirpro wool and other ﬂame retardant ﬁbres were reported, in the absence of any back-coating treatment, acceptable ﬂame retardancy of Zirpro-treated blends of 85% wool: 15% polyester/ polyamide could be obtained. Many modifications of the Zirpro process for specific needs were made, for example, tetrabromophthalic acid (TBPA) is used along with Zirpro to obtain low heat release wool. However, the presence of the heavy metal ions of zirconium/titanium and the ions of fluorine in both resultant Zirpro wool fibres and the effluent discharges could cause environmental issues. Efforts have been made, therefore, to develop a commercial process not dependent on heavy metal complexes. It was shown that the presence of intumescents applied as wool fibre surface coatings can enhance the flame retardancy of the underlying fibres and that evidence of char-forming interactions similar to those observed for cellulosic fibre substrates exists. The simultaneous char-forming reactions of the melamine phosphate dipentaerythritol based intumescent (MPD) clearly interact with dehydration, crosslinking and other unsaturation-promoting reactions via an associated semi-liquid phase, involving all components to create a complex char having enhanced oxidative resistance to oxidation above 450°C. Such treatment, however, seemed specifically effective for Zirpro wool. Recently, a new chemical modification of wool fibres and keratin polymers for enhancing their flame retardant properties with P and N synergic effects was reported. The chemicals used in this treatment contain organic phosphorus and nitrogen elements but did not involve any heavy metal ions, while the finishes need to be processed in an organic solvent. The thermal properties of the resultant wool polymers showed greater char residues (41.1% at 800°C) than that of Zirpro wools (32% at 600°C) during the pyrolysis process in TGA. Its LOI values of resultant wool fabrics (28~32%) were quite similar to Zirpro wool (27~33%). Flame retardant fibres are frequently blended with fire resistant fibres in technical textiles, including industrial protective clothing, to achieve multiple functionalities. For example, blends of Nomex with Kevlar are used in protective garments; blends of Nomex with FR viscose /FR wool are produced to make fire blocking fabric for aircraft seats. Blends of glass fibres with aramids, melamine fibres, PVC fibres and polyester are reported for use in fire protective nonwoven veils for upholstery and mattresses. Fabrics resisting burning could be achieved through blending wool with either high performance fibres such as aramid fibres (Nomex™ and Kevlar™) or chemical treated wool. It is shown in a study on the synergistic effects between wool and some high performance fibres that blending wool with p-aramides fibres (e.g. Kevlar and Technora) improves the FR performance and the thermal stability of the whole textile, while blending wool with PBO fibres does not show any sign of the enhancement of flame retardant performance of wool. Wool blends with aramid fibres, however, might have the disadvantages of poor abrasion resistance, difficulty in dyeing, poor UV and light resistance, higher rates of heat release, and higher cost.